Because Apple censor. All right, I don’t care much either way if they want to reject apps with sexual content, but when they disallowed political satire it became both personal and a matter of principle. They may have relented in the most celebrated case, but until the policy is changed explicitly they can insert the iPad 2 in landscape orientation. Otherwise, it’s a fine device. In particular I like the cover. Seriously. It protects the screen in transit, then it converts to a stand. Apple design cuteness at its best. The original was not at all feature-rich, the better to focus attention on the core concept. Now, again in typical Apple fashion, they add just a well-chosen few at a time so that each seems a choice delicacy. It finally has cameras and a gyroscope. Not the rather decent camera of the iPhone 4 though, and nor does it get its high-resolution display. There are real if fairly small improvements to its thickness and weight, but the only truly substantial change is a faster, dual-core processor. So this is, if you like, the iPad 3GS; most of what the last version lacked is fixed, but cool cover aside (which is an accessory anyway) there are no show-stopping innovations. This is the iPad released just to keep up with the burgeoning crop of Android competitors. It doesn’t blow them away – that will have to wait for the next release – but it undermines their most obvious advantages. So you want to wait for that next release, or go with one of these rivals? To answer this question, you must ask yourself why you need a tablet. And the answer of course is that you don’t need a tablet. Don’t be ridiculous. These iPad things are computers with all the parts you might do real work with actually removed. Get a grip, it’s a leisure device. A media consumption appliance. A toy. The question is, which is the best toy? Right now, I’d say the rivals are well in the lead. And it’s not about hardware (though we’ll get back to that). It’s more about freedom. Though Apple stuff is beautifully done, it is done with rather controlling ends in mind. Some say they are reinventing the publishing industry, and that may be true. I’m just not so happy about them wanting a 30% cut of it. I understand your objection to the restriction of apps that are specifically political satire, and while I don’t entirely agree, I won’t argue it. However, I will argue one point (you knew I’d have to comment): the iPad is no more a toy than any home PC, and it’s way, way more convenient for most things. Perhaps your experience with tablet PCs has you thinking of the iPad (and its mostly-potential competitors) as an underpowered tablet PC, but it’s a far different device. It’s casual, everyday-living computing, something new. I know, it sounds like Apple marketing speak, and perhaps it is, yet experiencing it for a few weeks radically changes your perspective. I wish I had the words to explain how different it is from what it seems like; perhaps one day I will. In the meantime I’ll predict this: in 2 year iPads (and their copycats) will outsell PCs for home use, and in 5 years they’ll outsell PCs period. …the iPad is no more a toy than any home PC, and it’s way, way more convenient for most things. I wouldn’t disagree for a moment – but of course, the vast majority of home PCs are toys. The one thing the iPad interface isn’t more convenient for is the entering and manipulation of large amounts of text or numbers – work. So I think you could be right about iPads and similar devices outselling PCs for home use. It is a simpler, nicer solution for most things home users want a computing device for. Not so sure about the five-year prediction though. I think by then there won’t be any clear dividing line between tablet-style and PC devices. Perhaps your experience with tablet PCs has you thinking of the iPad (and its mostly-potential competitors) as an underpowered tablet PC, but it’s a far different device. I’d be the last to compare it to a Tablet PC in fact. You talk as if I am finding the iPad wanting in some way! Not at all. I like it. It’s Apple I don’t like… Or to be fair, there are certain things Apple do that I don’t like. But they are to do with market control, not so much device design. I’d describe the Tablet PC as merely as a very nice kind of PC for certain tasks. 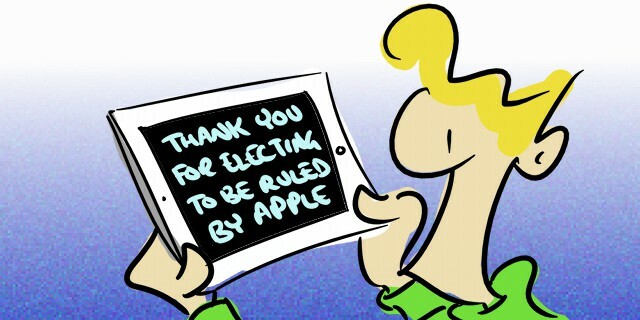 The iPad is a far more revolutionary product. If it’s any help in your search, the words I’d use would be “Maximally task-orientated device”. It has the minimum necessary amount of fixed hardware, the greatest amount of interface configurable to the particular task at hand. I wouldn’t disagree for a moment – but of course, the vast majority of home PCs are toys. Ah, but I wouldn’t call either of them “toys.” While you can certainly play with either, you can also communicate in ways more powerful than the phone, receive news more efficiently and effectively than the newspaper, yadda yadda. Phones, newspapers, televisions, radios, books, mail, encyclopedias, etc. aren’t toys, they are important and even essential parts of our modern lives. The iPad is simply a super-convenient version of all of those that manages to become those things in a way that PCs, including laptops, simply can’t. Holding a website in your hands, for example, and manipulating it with your fingers changes your sense of interaction and intimacy in difficult-to-explain ways. That’s the stuff I’m talking about, not the task orientation.